Ville Matvejeff (b. 1986 in Finland) has established himself as an exceptionally wideranging musician, enjoying success as a conductor, composer and pianist. He studied at the Espoo Music Institute and completed a M.Mus. degree at the Sibelius Academy, and he has performed throughout Europe and in the USA, China, Japan and Mexico. Matvejeff’s conducting career is progressing rapidly. In 2014, he became the Chief Conductor of Jyväskylä Sinfonia until the end of 2019. Since 2014, he has also been the Principal Guest Conductor and Music Advisor of the Croatian National Theatre HNK Zajc in Rijeka. Matvejeff was recently appointed Artistic Director of the Turku Music Festival, the oldest continuously run classical music festival in Finland. He is the founder and Artistic Director of New Generation Opera, presenting ambitious and technologically innovative performances. 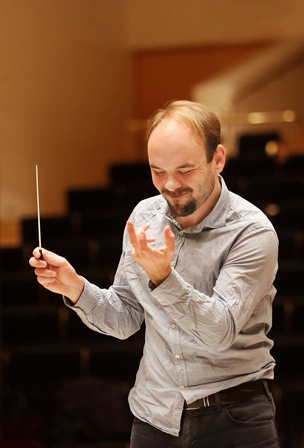 He made his opera début at the Pori Opera in September 2011 and has held positions at the Malmö Opera and the Royal Swedish Opera in Stockholm as well as working as an assistant with conductors such as Esa-Pekka Salonen and Leif Segerstam. He made his début as a concert pianist at the age of 18 and has since toured the world giving recitals with soprano Karita Mattila, with appearances at the Gulbenkian Foundation in Lisbon, the Hong Kong Arts Festival, Salle Pleyel and Théâtre du Châtelet in Paris, Wigmore Hall in London and the Zurich Opera. As a composer, he has recently received commissions by the Finnish Chamber Orchestra and the Finnish Radio Symphony Orchestra, for whom he wrote his Violin Concerto to celebrate the inauguration of Helsinki Music Centre in September 2011.